Sarah Jio has been away for a little while. And we've missed her! So we're glad she's back now with her latest novel, Always. (Which has a gorgeous cover.) Thanks to Ballantine, we have THREE copies up for grabs! We hope Sarah won't wait another two years to write her next novel. Check out Melissa A's review here. Kailey Crane thought she had it all; the perfect job, the perfect fiancé, the perfect life. But everything Kailey thought she knew is turned upside down one night when, on her way home from a romantic dinner, she stumbles across a homeless man on the sidewalk. A man named Cade McAllister. A man who was once the love of Kailey’s life. Ten years ago, the attraction between Cade and Kailey was magnetic. But the end of the relationship left Kailey devastated. Seeing Cade transformed into the man on the street strikes her to her core. Kailey decides to help Cade piece his life back together, something she initially keeps from her fiancé Ryan. As she revisits her long-ago relationship, Kailey realizes that she must decide exactly what – and who – she wants. 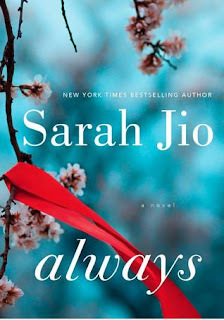 Sarah Jio is the #1 international, New York Times and USA Today bestselling author of eight novels. She is also a longtime journalist who has contributed to Glamour, The New York Times, Redbook, Real Simple, O: The Oprah Magazine, Cooking Light, Woman’s Day, Marie Claire, Self, and many other outlets, including NPR’s Morning Edition, appearing as a commentator. Sarah lives in Seattle with her three young boys. Giveaway ends February 7th at midnight EST. I have always thought about getting a book or reading based tattoo. I'm too chicken though! I have a tattoo of the word "hope" with an epilepsy awareness ribbon to support my daughter's battle with epilepsy. This one is easy for me. I have wanted to get Nani's name tattooed in memory of her. I had one of my gold Hawaiian bangle bracelets (with my name) changed to her name after I lost her. My ex also bought me one in silver. It would be Daisy, because that's my favorite flower. I would love a chance to win this book, it looks amazing. Thanks for this generous chance. It would be a cancer awareness symbol to honor my friends and family who have cancer or who have lost the battle with cancer. A piece of jewelry representing strength and courage. Bi tattoo for me. Necklace nice with hope. No tattoo for me. I have a crystal bracelet with the colors of cancer and a ribbon charm. The colors represent the different colors of the ribbon for the specific types of cancer. I don't want to get a tattoo, but I have been thinking of getting a charm bracelet. I would like to get charms that represents what I support and love. In my younger days I wanted a small tattoo of a butterfly on my ankle. I never did get around to doing it. FAMILY - they mean the world to me. I want a tattoo with a semi colon. It's based on "Project Semi Colon" which raises awareness for mental health and suicide prevention. I'd like something that had to do with keeping the faith!! I really really want a tattoo but am waiting till after my surgery and I've lost weight. I would have to say either books, read or strength because of everything I've been through.